Warren Keelan discovers a wild and untamed angling paradise along the coast of Efate – Vanuatu. 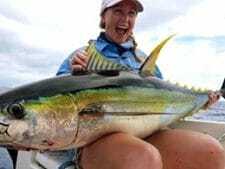 It had been high on my to-do list for quite some time, and with recent reports of big dogtooth tuna, mahi-mahi and wahoo throwing their weight around, along with an abundance of untamed coastal waters, I was keen to see what all the fuss was about. It was also the time of year where I get to spend a week or so with my better half, swapping work and its associated stresses in exchange for some relaxing and quiet time away. Our destination was Efate, the third largest of Vanuatu’s island cluster. 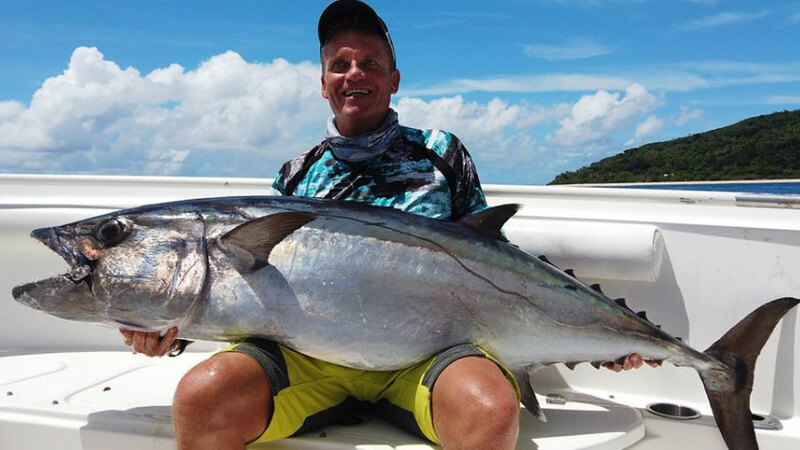 Efate is one of many angling hotspots located in the South Pacific, and is only a few hours flight from Sydney. We saw this as an opportunity to soak up some sun, a time to relax in the laid-back Ni-Van lifestyle and explore its many coastal treasures, food and culture – sounds awesome! A relaxing getaway can mean many things to holiday goers. For me, this includes a day or two on the nearest waterway or ocean chasing its local inhabitants by means of rod and reel. How could I visit such a hot fishery and not wet a line? Prior to my departure I had organised to meet with the skipper from one of the area’s newest fishing charters, Ocean Blue Vanuatu. 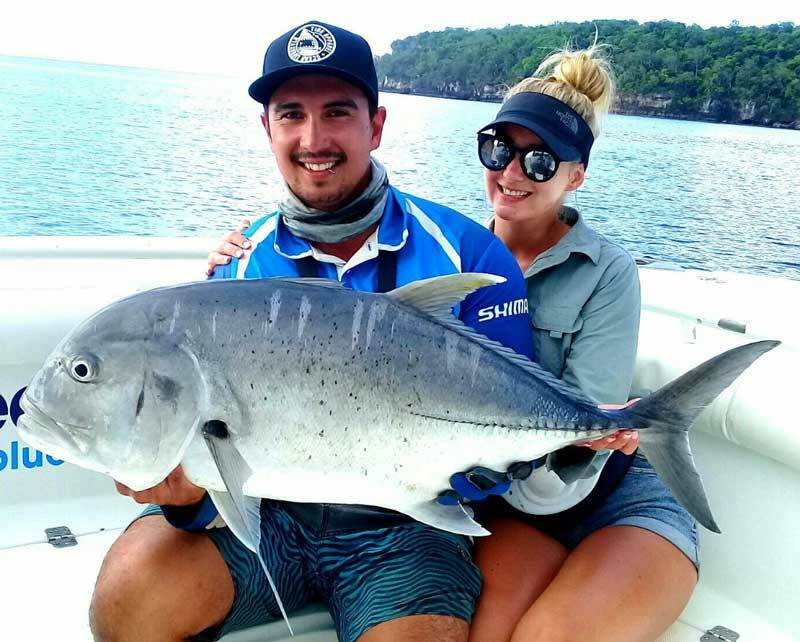 At this stage Ocean Blue (O.B), an Australian based fishing charter company, were in the planning stages of setting up operations in Efate, and with so much angling potential it’s easy to see why they chose this location. After a few days of sight-seeing, shopping and basically doing bugger all, I was allowed off the leash. I guess it worked out well, as Michelle had had enough of me for the week and I was busting to fish! The weather hadn’t been the greatest for travelling the island anyway, so after a couple of phone calls I’d organised a day on the water with Andrea Traverso, soon to be skipper of O.B Vanuatu and his decky, Guillaume, in search of a few dogtooth tuna or whatever else was roaming these wild waters. Andrea picked me up from the resort around 5:30am, and we proceeded south. He’d arranged a boat and crew to accompany us for the day, and although we were driving through torrential rain, my spirits remained high and dry. Considering the size of the main island, there’s still a great deal of ocean which has yet seen a live-bait or lure pulled through its blue water – so much potential! Andrea was keen to take me to the southern tip of Efate where he has been landing numbers of dogtooth tuna; a fine eating, super strong and aggressive predator which hunts the inshore reefs and seamounts for prey. After launching the boat, it takes all of about fifteen minutes to reach tuna territory. As the reefy coastline drops sharply into warm deep blue water, we immediately notice markings on the sounder. The outriggers are set up, and a spread of four various coloured skirted lures are sent out the back. Andrea favours the chartreuse and lumo colours of the Pakula range for these large predators and it doesn’t take long to see why. Within minutes one of the furthest lures is engulfed and line instantly screams off the overhead; textbook game fishing and only a few kilometres from shore! Happy to jump on the camera, I couldn’t help but just sit and admire the sheer power and strength of these mighty fish – and why they are so sought after in these parts of the world. Pierre-Henri, Andrea’s uncle, eventually coaxed this beast to the surface and with a quick and precise gaff shot from Guillaume we had our first dogtooth on board for the day. Dogtooth tuna are one of the toughest predators in the sea, especially around shallow reef edges. They bite hard and they fight dirty, generally leaving anglers bewildered and feeling somewhat outclassed. These fish are equipped with large dog-like teeth (hence the name) and are capable of busting you up in seconds. The lures had found their targets but it was only the start of things to come. The rain eased which in turn left the sea with an eerie sense of calm. As we pushed the boat into gear, dozens of small flying fish darted from the bow, and in the distance, an area the size of a football field began to erupt. Baitfish anxiously broke the surface, and small tuna taunted from below. Birds began to signal activity and we knew something was brewing. Venturing to new locations often means sighting or catching new species, and for me it’s all part of the attraction. The next species to grace the deck was something which, at first glance with their elongated blue-green and white bodies and large yellow tails, could be mistaken for a version of our own Aussie rat kingfish. 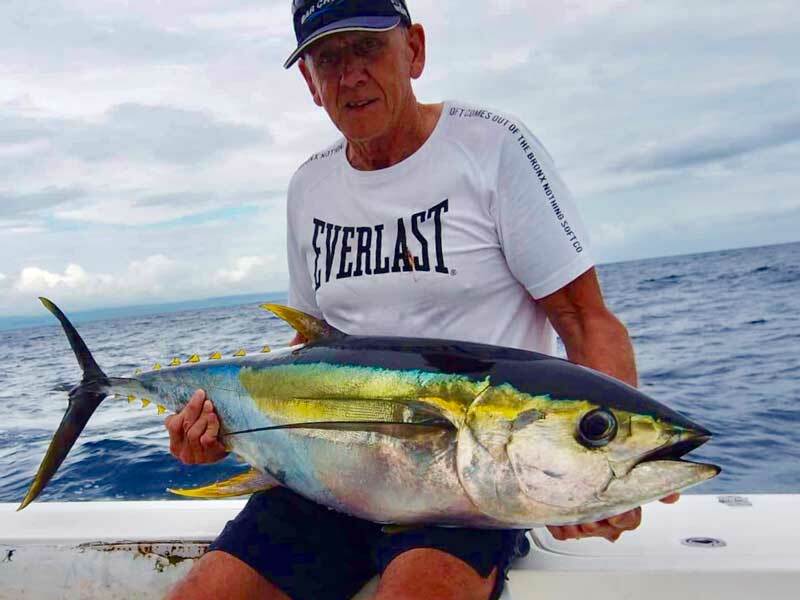 The rainbow runner, or Hawaiian salmon as they are often called, are prolific around these waters, and not only are they great light gear sportfish, they also make ideal whole baits or trolling and down-rigging for larger predators. 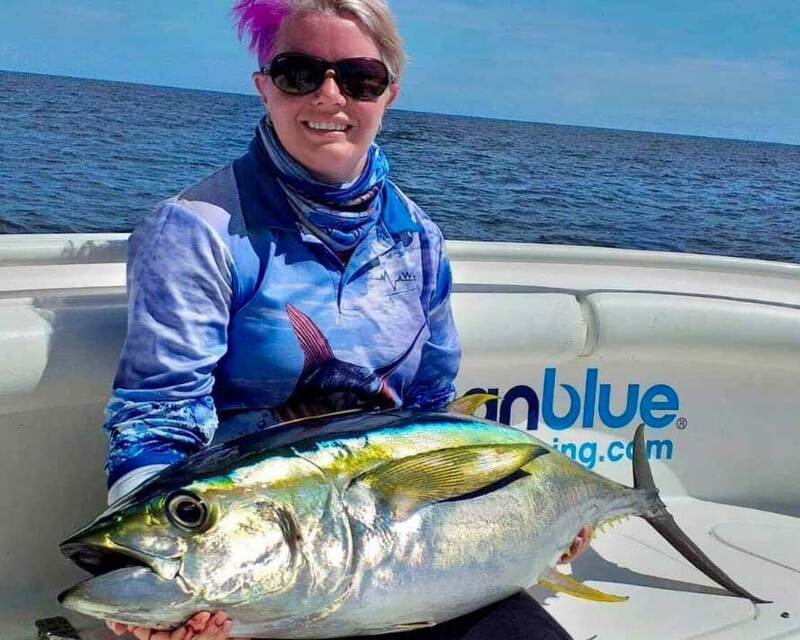 Andrea wasted no time in switching the skirts for dead-bait rigs, and knowing how successful they are along this coast in finding bigger fish, rigged a couple for the next troll. I guess it’s a case of think big and you’ll find big. We used a double hook system for rigging rainbows as dead-baits, attached to wire trace before eventually connecting to leader material. 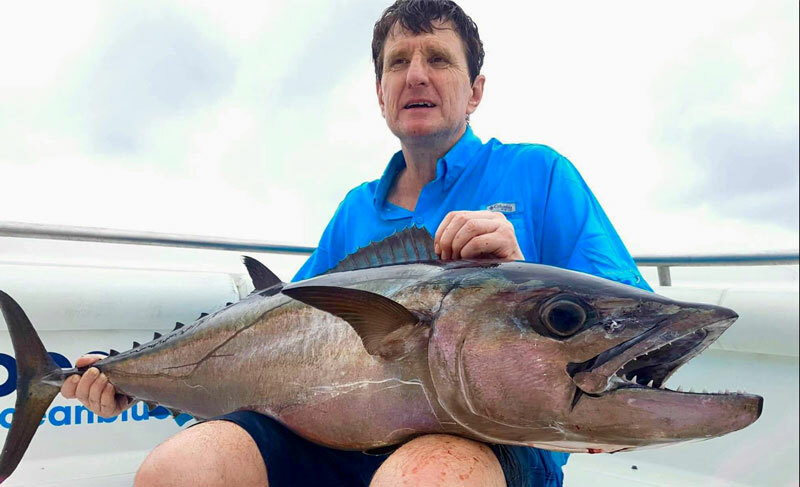 Apart from razor sharp dog-toothed tuna, you can also encounter some of the largest and angriest wahoo round, and they mean business, as I was soon to discover. Two rigs were sent off the transom, one being an unweighted presentation trolled approximately 40 metres back on the surface, and the other attached to a downrigger in order to cover more of the warm blue water column. Pulling baits around this fish rich coastline means you can encounter the most unexpected action, and it’s often what you’re not expecting that takes a fancy to your presentation. I’ve seen some amazing things while fishing the tropics, but what I witnessed next was just insane. Keeping your eyes on your presentation means you often see signs of interest from approaching pelagics before an advancing attack, but there was no warning when a monster wahoo leapt from below the skipped bait and launched upwards, almost clearing the ocean surface. Its shoulders resembled that of a 44 gallon drum and the explosion it created was as if a subsurface missile had found its mark; one serious fish. Before I could lift the rod from the gunwale it was game over – caput! After a few choice words and some adrenaline charged laughs we knew we had been taught a lesson. Like I said, you really don’t know what you’ll come across out here, and although we were armed with heavy leader and large hooks, it just goes to show how big and fierce these opponents can be. You have to lose at least one good fish in a session right? With that out of the way and another rig sent off the back we were now more determined to find these doggies, and land them! The deep rig fired next and I jumped on the controls. The biggest concern after hooking onto these tuna is the presence of sharks, so it’s a matter of digging in and getting your fish to the boat as quick as possible. It was by no means a big fish by dogtooth standards but with another new species to add to my account, it was more than welcome. Over the following hours we hooked and landed quite a few decent fish, including some oversized barracuda – yet another large predator which roams the tropics in search of an easy feed. 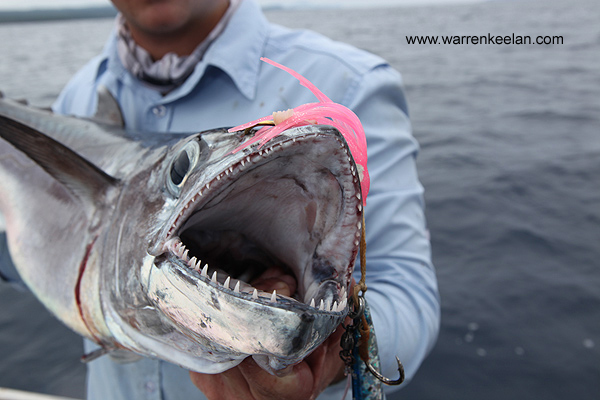 For many serious anglers, the barracuda is somewhat of a pest when chasing quality table fare like the dogtooth, but to be honest I still get a buzz from fighting these toothy monsters. With so many species haunting these waters, you can’t pick and choose what takes your bait, so it always pays to be prepared – and be prepared to have fun! Andrea knows this part of the island well, and with a few hours left to kill, decided to take me to an area which consistently produces good fish – but this time we will be putting our arms and backs to work. We proceeded around the southern edges and into more shallow water near Manuro Point. Whilst trolling big baits we had found most fish in between 60-80 metres but our next mission was to drop large knife jigs into only 20-30 metres of water. This is what you could term ‘skinny water’ jigging for dogtooth and I was chomping to see what we could produce. The sounder lit up with large arches and before I could get my camera gear ready Guillaume had already began cubing off the back. To attract and keep these fish in the area it’s always an advantage to create a trail of burley. Scraps or chunks of striped tuna or off-cuts of frozen fish are perfect for the job and it’s simply a matter of throwing single pieces every few seconds, similar to cubing for yellow or bluefin tuna. Andrea dropped a 200 gram knife jig into the depths and after a few pumps he had found the mouth of an angry dog. Unfortunately when these beasts grab your lure, they fire up and head straight back down, almost ripping the rod from your hands. 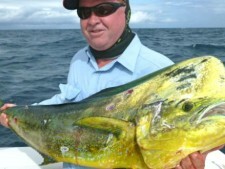 This fish however proved too powerful, winning its freedom and leaving Andrea with no choice but to re-rig and recover. I was next to hook onto one of these shallow water hunters and once again I was unable to tame my opponent. Within seconds this fish had peeled at least 30 metres off my spool and busted me off … yep! I see what all the fuss is about! Jigging is certainly not for the faint hearted, but finding a rhythm as you pump and wind you’ll definitely conserve energy. One of the best techniques for this type of fishing, and one we use a lot when jigging for kingfish, is to lift your rod as you wind down. This not only eases the pressure on your back and forearms, it also allows you to work a lure a lot faster through the water column while also encouraging more action. We persisted for at least another hour in and amongst the reefy drop-off, losing more fish than we landed before making the decision to call it a day. 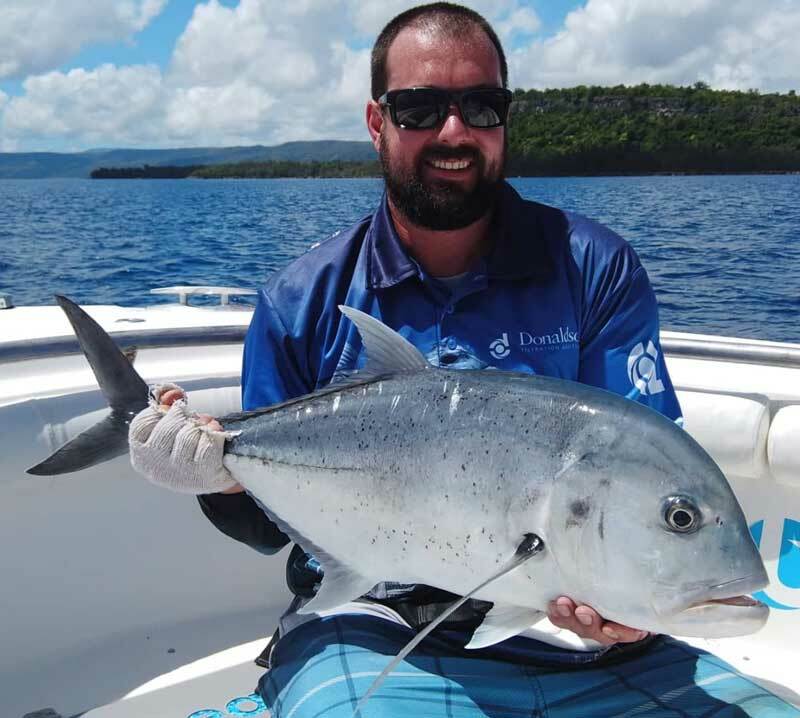 Vanuatu is not only home to some of the biggest pelagics and deep water adversaries in the ocean, it’s also home to a list of reef bound species which temp anglers from all over the planet. Knowing I might not be back for a while, I couldn’t resist throwing a surface lure into the shallow reef in the hope of seeing either a resident trout or even one of the large red bass that live in these parts. My arms were literally burning from the day’s action, but all pain is forgotten when my lure is met with an almighty explosion upon reaching the water. Andrea had handed me a medium sized popper to tie on for a few casts into the coral and it was spot on. Unfortunately I was unable to stay attached to what we think was a solid trout and I was once again left with my tail between my legs. Andrea gave it one last crack with one of his favourite poppers, ripping it as hard as possible across the surface. Large reef predators love nothing more than a noisy, water-pushing lure, so on the third pull across the foamy water, he had caught the attention of a solid resident bass. Nothing beats the excitement of watching fish smash a lure from the top, at times lifting the lure clear from the water in attempt to chase down and maim their prey. This fish had topped of an amazing day on a relatively new and untamed part of the ocean – at least for me anyway. Clouds began to merge for an afternoon downpour so after packing up the gear it was time to head back to my lodge and describe the day (in detail mind you) to my wife, who is always happy to see me after being away fishing – or is that just wishful thinking on my behalf? • Vanuatu is a wild place, be prepared for anything! • Bring as much gear as you can – unless you have booked a charter with an experienced crew such as Ocean Blue who supply just about everything. • The weather in Vanuatu can be unpredictable at times, remember to take plenty of sun cream and wet weather gear for those overcast days – remember you’re in the tropics. • Located in a remote destination means you’re far from the nearest hospital so use common sense at all times. • Increase hook, line and leader strength to be successful on large predators – and expect the unexpected!